While pelagic birding trips off the Cape Peninsula are an unforgettable experience for the unique birding opportunities afforded, the Cape waters are also renowned for unpredictable weather conditions, and on occasions leave pelagic passengers wishing that they had been better prepared for their day at sea. The pelagic trips venture to a distance of 45 km or so off shore, and expose one to conditions that are sometimes quite different from on shore. Even on days where the weather appears to be fine, windless and sunny on shore, there is always a strong possibility that there will be a swell running at sea with maybe a wind blowing, creating conditions for spray. Thus the first rule for pelagic trips is to bring a waterproof clothing layer, preferably a waterproof jacket or parka and waterproof leggings. It is also in general noticeably colder at sea than on the shore, and if there is any sort of wind blowing over the water the chill factor induced by the wind can drop the temperature quite significantly. Thus the second rule is to bring adequate warm clothing. A layering system of clothing is the most convenient, so that if you find out that it is calm and balmy at sea, it is easy to remove a layer or two to avoid becoming too hot. 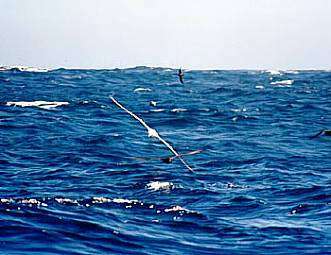 Although conditions are sometimes overcast for an entire trip, it is more likely that the sun will be evident for some or all of the day on most pelagic trips. One is exposed on the boat, and so it is essential that you wear suitable headgear to provide some shade and sun protection. A wide brimmed hat provides good shade, but becomes a hindrance if there is a wind at sea. Woolly hats or baseball caps are probably the most appropriate headgear. The sun also leads to a great deal of glare, in particular due to reflections off the sea, and so even if wearing good headgear you are likely to be exposed to more solar radiation than on the equivalent day on shore. Thus the next rule for pelagic trips is to bring sunburn cream, and to apply liberal coatings to exposed skin, in particular your face. The glare can also strain your eyes, especially when a sought after bird flies towards the sun, so it is wise to bring a good pair of sunglasses. Finally, even the fittest person can succumb to seasickness, and even the old sea dogs occasionally feel less than perfect during some of the rougher pelagic trips. Thus it is wise to take seasick prevention medication prior to embarking on a pelagic trip if you have any doubts over the state of your sea legs. It is suggested that you chat to your local pharmacist to ascertain what particular seasick or travel sickness medication they recommend. Spending a day at sea uses a little more energy than your average day watching sport on TV, as you are constantly compensating for the movement of the boat. Consequently it is normal to work up a healthy hunger after a few hours at sea. A sandwich lunch and soft drinks are served on the Zest for Birds pelagic trips, but for those with a healthy appetite it is a good idea to bring some snacks or fruit to munch on up until lunch. Due to the great deal of variation in the weather conditions in the south western Cape the above recommendations apply throughout the year. Typically, however, the southern winter is characterised by north westerly winds, colder weather and slightly wetter conditions at sea, while the southern summer is characterised by south easterly winds and generally more sunny conditions.